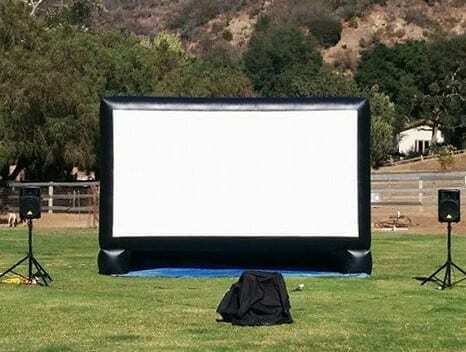 16 ft Inflatable Movie Screen Rentals - Just 4 Fun Party Rentals, Santa Barbara CA. 16 ft Inflatable Movie Screen Rental. For a true movie theater experience this is the rental for you! Upgrade your own outdoor movie theater experience with this 16 ft outdoor inflatable movie screen or rent the entire Movie Theater Package and upgrade the included 10 ft framed screen to this larger screen. A 16 ft screen is best for up to 300 guests+ or if you just want a bigger movie screen for your party or event. For a smaller projection screen try our 10ft Movie Screen or for indoors we offer HDTV rentals, or a 100″ pull down screen. To view this item used at a park event, click here. To view common concessions rented with the Outdoor Movie Theater, click here.